Painting Company Castle Rock: What Makes Us Different? When it comes to finding a painting company in Castle Rock and the surrounding area, we know that you have options. At the end of the day, our team strives to be the absolute best in the business. We know firsthand the value in being able to come home to your living space at the end of a long day and feel great about your surroundings. It’s part of the reason that people spend time and effort on making their homes feel cozy and inviting. Whether your goal is to recreate a particular look in a magazine or you have an idea of your own, our crew of professional painters is here to help make your vision come to life. Now that temperatures here in Colorado have taken a drop, most of our focus is going to be on interior painting in the coming months. This is a wonderful thing because it means that you can totally transform the look of your living space. But why choose Barco’s? As a matter of fact, that’s the topic of today’s post. 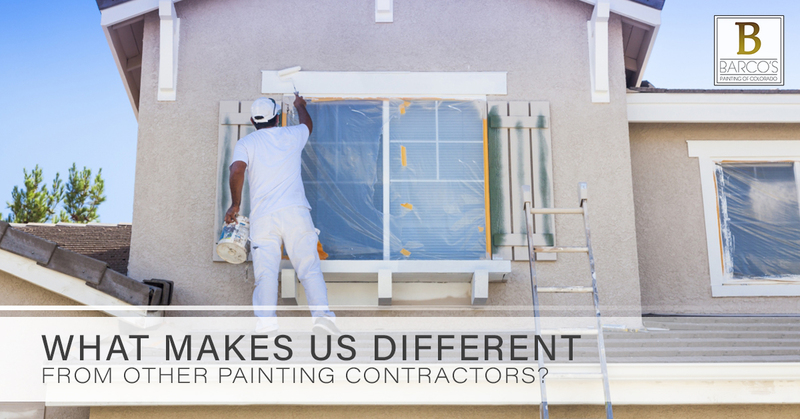 If you’re searching for painting contractors and considering your options, be sure to keep us in mind. Learn more below. One of the things you want to make sure of when choosing painters is that they care about attention to detail. After all, there’s nothing worse than thinking a paint job looks great on first glance, but finding many problems that pop up down the line. For example, if you’re having your doors painted, did the painting crew tape off the door frames and hinges? Did they leave the doors open for an appropriate amount of time? Are there little drops of paint on the floor? These things can make a big difference at the end of the day. Our team takes the detail work very seriously. We know that it’s the little things that can have the biggest impact on a home and that’s why we’re proud to provide the peace of mind you need. Winter is the perfect time of year for an interior painting project, and thankfully we offer a wide variety of interior services! Planning a remodel? We’d love to take care of the paint. Need some drywall patched or repaired? How about wallpaper removed? Perhaps you’re considering having your cabinets painted? Whatever the case may be, we can handle it. Although we’re not doing much exterior painting at the moment, keep us in mind for your next big project! We do everything from pressure washing to exterior spraying to deck staining and more. No matter the project you have for us, our team would love to take it on. We use only the highest quality products from the most trusted names in the business. In other words, when you choose us, you can expect that you’re getting high quality paints and attention to detail; that means the end result is a true thing of beauty that you can enjoy for years to come. Among the most-beloved elements of our company is the fact that we happily offer a free color consultation. We know just how difficult it can be to get the colors inside of your home just right. If you’ve ever done some painting on your own and found the results to be less than ideal, worry no more. Having a vision of things and then seeing that it just doesn’t quite come together the way you want it to can be incredibly frustrating. Luckily we are here to help. We also offer free estimates for our work. They’re no hassle for you, and there’s no obligation to choose us. We don’t like it when pushy salespeople try to talk us into choosing them and we won’t do the same to you. Instead, we’ll present you with an estimate, provide you with your options, and let you make the decision undisturbed. No job is too small, so reach out any time to get the process started. At the end of the day, we believe that a person’s home is the place that should bring them the most joy, so no matter what your goal is, you can count on us to help provide you with a space that you actually enjoy spending time in. That’s what it’s all about. As we mentioned at the beginning of this post, we know that you have options about the painting company that you’ll choose. With a reputation that’s built on trust and success, we want you to know that you can count on us to get the job done the right way every time. When it comes right down to it, we are more than just painters. We’re a local company that is determined to provide Castle Rock residents with exceptional finishes at fair prices. It’s as simple as that. Our community is growing quickly — which makes sense because we live in one of the most beautiful places on earth — so whether you’re new to the area or you have been here for decades, Barco’s Painting of Colorado is here to serve you as you make your home the living space of your dreams. Contact us today to get a free estimate and rest assured that you are in good hands. We look forward to hearing from you!